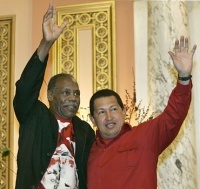 17 "Free the Cuban 5"
20 "John Conyers’ 50 Years of Service"
Danny Glover is an actor and "progressive" activist. Randall Robinson's recollection of his most recent meeting with Castro in 1999 reads like something out of a romance novel. (Others joining him on the trip included Danny Glover and Johnnetta B. Cole. From Jan. 24 - 27, 2003 the World Social Forum was held in Porto Alegre, Brazil. 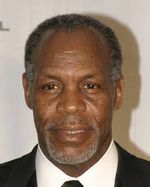 Danny Glover attended the forum, and on Jan. 27, delivered a testimony to the attendees. Anti-Iraq War March and Rally Feb. 16, 2003, with Bonnie Raitt, Danny Glover, Dolores Huerta, and Hatem Bazian. In August 2004 Danny Glover an actor endorsed an anti “Bush Team” Protest at the Republican National Convention in New York, organized by Not In Our Name, an organization closely associated with the Revolutionary Communist Party. "It doesn’t take a rocket scientist—it really doesn’t — to figure this out. We can talk about all kinds of statistics and strategies around profit, about all the theories around markets. But there is something in that discussion that cannot be reduced, that cannot be ignored. What cannot be reduced is those who don’t care about what happens to human beings, what happens to children, what happens to those who work all their lives and who then retire. We cannot be reduced to forgetting about that. No matter what the market strategies, whatever the market theories, whatever the current economic theories are, we cannot be reduced to believing that all of this is natural science. This is not natural science. This is about what human beings do and how human beings transform themselves or not transform themselves, how human beings themselves act and decide what is important. If life and the preservation of life is important, then that is what we have to elevate. Not the preservation of profits, not the preservation of evil-spiritedness, not the preservation of inhumanity. We have to hold on to the preservation of people. And unions do that. Unions talk about the people and they do that." 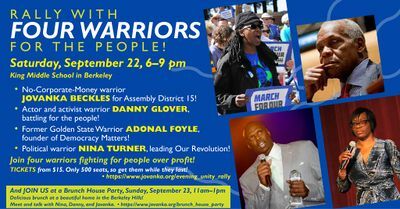 In early 2008 Barbara Ehrenreich, Bill Fletcher, Jr., Danny Glover and Tom Hayden Initiated Progressives for Obama. In 2008 Danny Glover signed a statement circulated by the Partisan Defense Committee calling for the release of convicted “cop-killer” Mumia Abu-Jamal. 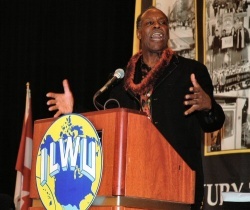 In late May, 2009, actor Danny Glover joined labor, political and civil-rights leaders on one of the first stops of a four-day, 11-state tour supporting U.S. manufacturing workers. Glover, the son of union members, said he stands with those affected by plant closings. The event also included the Rev. Jesse Jackson, U.S. Sen. Debbie Stabenow and United Steelworkers International President Leo Gerard. July 17, 2009, the Justice for Reggie Clemons Campaign welcomed the resolution of the Missouri State Conference of the NAACP, the nation's leading civil rights organization, in support of the nationwide effort to secure justice for Reggie Clemons. The resolution was passed at the NAACP's 100th Anniversary Conference being held in New York City. In its resolution the rights group announced that it has launched a clemency campaign on Clemon's behalf and lauded the decision of the Missouri Supreme Court to appoint a special master to look into the case and investigate claims that Reggie was wrongly convicted and sentenced to death. The Court acted in response to a petition for habeas corpus filed by Reggie's attorneys on June 12th. Jamala Rogers, the coordinator of the Justice for Reggie Clemons Campaign, called the NAACP'S action, "critically important to the struggle for justice in Reggie's case." She added, "we hope and believe that Governor Nixon is paying attention to the numerous and important voices who are urging a fresh look at the very disturbing facts in this case." In addition to the NAACP, groups including the ACLU, the National Coalition to Abolish the Death Penalty and high profile individuals including Congressman William Lacy Clay, Danny Glover, Mike Farrell and Bianca Jagger have spoken out on Clemons's behalf. Reggie was sentenced to death for the 1991 murder of two young women who drowned after plunging from the Chain of the Rocks Bridge into the Mississippi River. David Lerner/Karmen Ross, Riptide Communications were contacts for the campaign. Glover and Holder were too young to be part of SNCC, but both emphasized that they would not be where they are today without SNCC and its heroic struggle for African American liberation. Danny Glover also talked about the system of capital and pointed out that SNCC and the Southern Christian Leadership Conference, led by Dr. Martin Luther King, met their stiffest resistance from the establishment when they "dared to challenge the very basis of capitalism, money." Congress will vote on the most significant free trade agreements since NAFTA: the Panama, Colombia and Korea Free Trade Agreements. Even as our country is staggered by 9 percent unemployment, which these deals would make worse, the press has largely shut out this issue. In response Firedoglake held a Virtual Town Hall , October 10th featuring actor and TransAfrica Forum board Chair Danny Glover, Congressional Black Caucus Chair Emanuel Cleaver and and Professor Joseph Jordan of TransAfrica’s Scholars’ Council. Signers of New York City Mayor Bill de Blasio's May 12, 2015 launched The Progressive Agenda to Combat Income Inequality included Danny Glover. This page was last modified on 14 December 2018, at 15:50.